Yeah-h-h-h. Tomorrow marks the beginning of the light at the end of the tunnel!! Only 1 3/4 months till Spring. Do I sound anxious? Maybe a tad bit. Right now, I look out at dirty snow, gray skies, naked trees and a few ice patches. In a few short weeks, I'll be able to look out at green leaves and pine needles, blossoming trees, flowers and a mud puddle or two. I'll take it!! Today was one of those days where life just gets in your way. To start off my day, my car was looking a bit peculiar. It had a larger than life FLAT TIRE. Now how did that happen? So my brother had to take me on my errands. When we got back home, the wind had knocked some tiles off my roof. I looked up, and lo and behold -- yup!! the roof needs fixing. 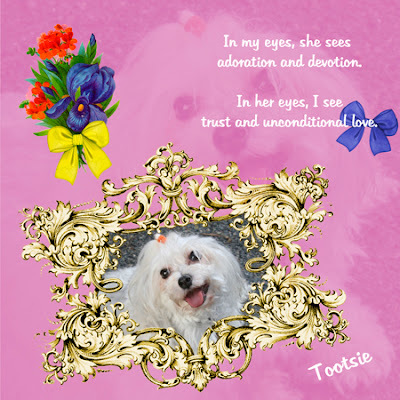 You know, I have to count my blessings though, so I picked up my Tootsie and hugged her. It won't fixt the tire or the roof, but it made me feel better. After all that, the rest of the day got better. A friend in Scotland sent me a nice long note that really made my day. After that, I did a bit of scrapping. 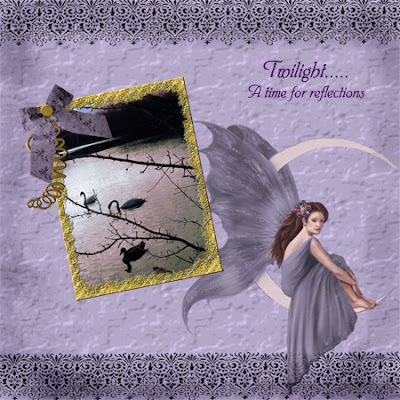 Tonight I'll share with you a layout that I made for a scraplift challenge at KST. 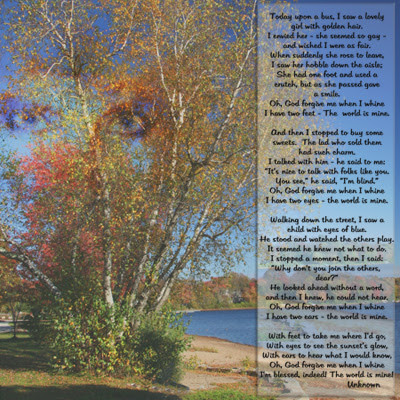 The background is my own photography, the poem is "author unknown." Today was another nice warm day (in the 40's), even with the rain. Our lakes and ponds are so low, we need the rain. This chat won't be long today. My daughter in law is coming to visit, and I have to make us some dinner. Today, I'm going to share some new layouts that I worked on last night. This first one was made with Snow Raven's "Valentine Groovy Guys" kit. 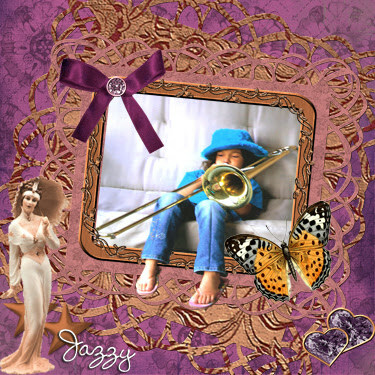 This next layout was made using Snow Raven's "Valentine Groovy Girls" kit. Well, the promised heat wave finally made it here. Today, it was gorgeous (above freezing)! I spoke with a friend today who said it's supposed to be 40 below (with wind chill factor) where she lives tonight. Me thinks it's time I stopped complaining about the cold. I think at 40 below, I wouldn't come out until Spring was here. Speaking of Spring, check the calendar -- less than 7 1/2 weeks away!!!!! Once you pass the age of 55, it's not nice to wish away the weeks, but the warmer temperatures make it so tempting. Today was actually a good day, though. 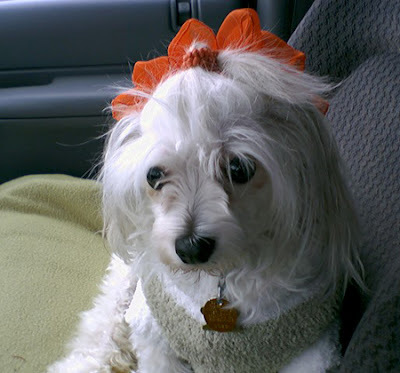 Tootsie and I got out and paid some bills, did a speck of shopping and kept her doctor appointments. Tonight I can do some scrapping. I have new kits from Snow Raven that I want to play with. So I'll leave you with a layout that I made with Snow Raven's kit "Heart To Heart." It goes with the last layout posted. If you haven't guessed, this is Michael and me, our Spring and our December. I can't believe that it's almost February already!! Time certainly flies much quicker now than it used to. At least that's how it seems. 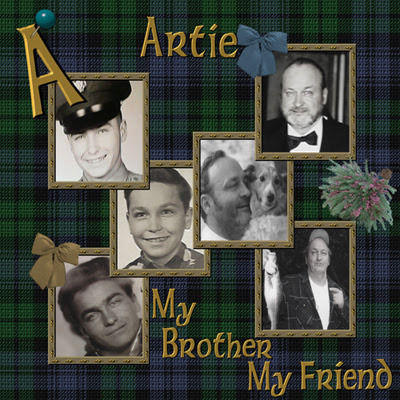 I've added a new link for you to check out. 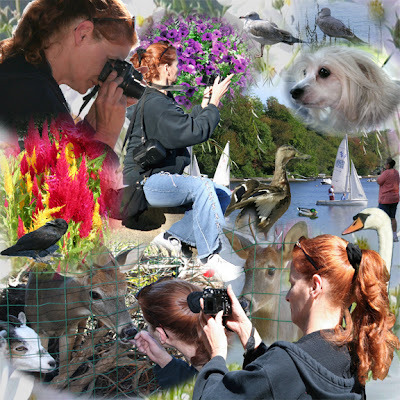 It's a forum I belong to where you can learn all about Photoshop and photography. It's free to join, and you'll meet some great folks. While you're there, check out the weekly and monthly challenges. That's it for now. 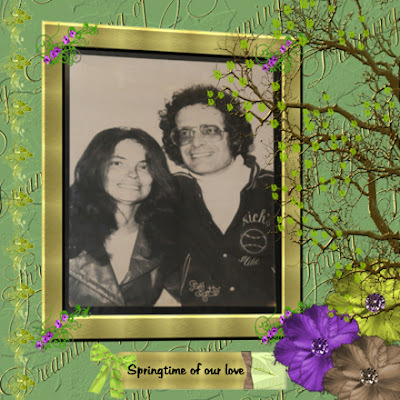 Today I'll share with you a layout that I made with Snow Raven's "Dreaming of Spring" kit. They say it's going up over freezing this coming week. I don't like wishing away the days, but I sure could use some of that warmer weather. Yesterday, I got a new cell phone. It was time. The old one only lived an hour or two at a time, and only if you weren't using it. It also didn't work in too many of the places I was usually at. The young man who waited on me was kind enough to send the photos on my old phone to my e-mail, so that I wouldn't lose them. I thought I would share one of the photos with you. The picture quality was so much better than I realized. The young man told me that the picture quality on my new phone would be even better. So now I have to take a few pictures to see if he was right. I know this is most likely called a montage, but I like to scrap this way. This whole picture shows how my daughter, Audrey, and I spent three days of her vacation a couple of years ago. It took 18 photographs to make up the picture. Behind everything, there is a photo that Audrey took of some little white flowers. Actually, 14 of the photos were taken by Audrey. I took the four of her. Needless to say, this is one of my favorites. A Very Chilly Thursday, Brrrrrrr. Gosh, I can't stand this cold weather. The good news is----Spring is only two months away, and I, for one, can't wait. In the meantime, I'm taking designing classes, taught by Snow Raven at KST. So far, we've made our color charts, and our basic background papers. Next comes the good stuff! The textures and the elements (some call them embellishments). I can't chat too long today - have shopping to do. I'll leave you with a layout that I made using Snow Raven's kit "Bonnie Scotland - Highland Spring." Well, I've been busy all day and managed to accomplished just a tad more than zip. The weather has been so cold, yuk! Not my cup of tea. 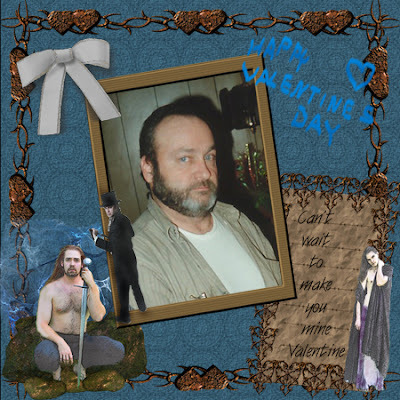 However, Snow Raven just finished some new Valentine kits, so there will be new layouts for them soon. What a nice surprise, my brother made me dinner -- New England Boiled Dinner. For those of you who may not know what this is - it's ham, potatoes, carrots, cabbage, & turnips all cooked together in a very large pan. Yum! In the meantime, I have a couple of layouts to share that I made for the challenges at KST. The first was for the "ABC" (letter A) challenge. 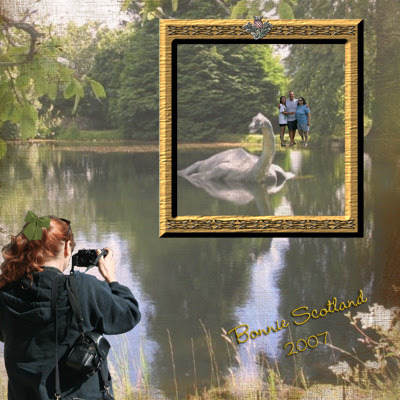 I used the following kits by Snow Raven: "Brave Heart", "Highland Spring", "Let's Go Funky", "Bonnie Scotland - Nature's Beauty" & "Bonnie Scotland - Blue Seas." My next layout features a very special little lady, who has a flair for big, big music. I used Snow Raven's "La Belle" kit. You might want to go over and check out Snow Raven's Blog. That's all for today. I'll have more for you tomorrow. I don't know where the time is going, but it seems to be flying by rather quickly. When I was younger, I remember how time moved very slowly and sometimes even seemed to stand still. Now that I'm a bit older, time seems to be moving much faster than I would like. This first one is called "Twilight" and was made for the "Elements" challenge, using pieces from Snow Raven's kits: "Bonnie Scotland: Autum", "Let's Go Funky", "Rose Fantasia", and "Fantasy." 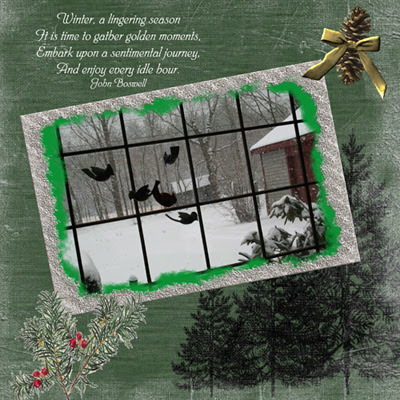 This next layout was made for the "Quote" challenge, using Snow Raven's kits: "Goodbye to Summer", "Let's Go Funky", "Christmas", and "Bonnie Scotland: Nature's Beauty." That's all for today. Tomorrow, I'll have some new layouts to share. Good morning. Today's post wil be short. Have to do laundry and house stuff today. But I did want to share a new layout with you. The kit used is my own, and the little dog is Tootsie. Till tomorrow, have a great day. Here's a picture my daughter, Audrey sent to me. She has recently taken up taxidermy and related crafts. This is a custom Antler Rack she has just finished. Great job, Audrey. I'm very proud of you. 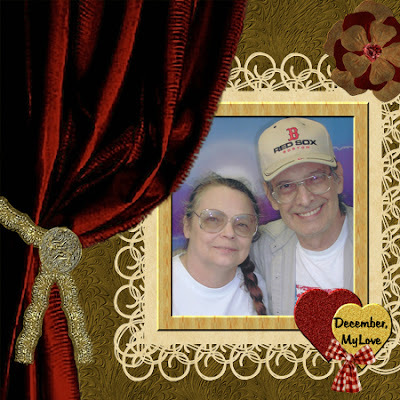 My name is Edna B, and I'm making this blog as a place to share photos and scrapbooking layouts and/or information. I'm fairly new to scrapbooking, but slowly becoming addicted to it's creativeness. I am proud to say that I recently became a "Scrap Raven" (creative team member) for Designer Snow Raven. Soon, I will be adding a link to Snow Raven's blog so that you may check out all her beautiful designs. That's it for today. Thanks for coming to visit.